The water was so clear, it felt like I was snorkeling and watching the fish through a glass diving mask. Actually, I was standing over a hole in the ice just slightly larger than the face window of a diving mask, admiring every twist and turn of the lake trout’s long olive body, every flare of its white-edged fins. Besides the water clarity, the fact that a hooked laker was bumping bottom within a long cane pole’s length of my booted feet was remarkable enough. Lake trout are typically targeted in depths greater than 30 feet, and some places, you’re not reaching them until you’re down 50 feet or more. But when and where conditions are right, you may catch them much shallower under the ice. Indeed, on this trip to Otsego Lake, outside Cooperstown, New York, we were hooking lakers over an 8-foot bottom. The 9-mile-long spring-fed glacier lake is also known as Glimmerglass, a monicker attributed to author James Fenimore Cooper, best known for writing the Last of the Mohicans. The recurring hero of two other well-known books, The Pioneers and The Deerslayer, strode the shores of Otsego, or what Cooper called Glimmerglass Lake. Whether Cooper himself coined the descriptive nickname or merely alluded to an existing name, it has stuck, and like so many of New York’s natural lakes, Otsego remains amazingly clear, especially under winter ice when there is no run-off. That clarity alone might bring lake trout up from the depths to attack elevated baitfish, but in recent years, something else has been happening on Otsego, something that has become a too-common occurrence on many northern lakes. For no obvious single reason, the alewife population has crashed, and alewife was the forage of choice for the lake trout in Otsego Lake. Mark Cornwell, a professor in the fisheries department at State University of New York, warned me that I might find Otsego’s laker population slimmer, if not in numbers then in girth. Prior to the alewife decline, Otsego lake trout were often taken at depths of over 100 feet, where the alewife schooled. But with alewife no longer abundant, the old adage “Follow the bait to find the fish” is in full effect. According to guide Kevin Murphy, the lakers have turned to bullhead, feeding in the shallows where the little catfish thrive. Murphy said he learned this by setting tip-ups shallower after being frustrated by his client’s lack of success at the old deep-water spots. When he cleaned one of those first shallow-caught lakers, he found its tummy full of bullheads, confirming the reason for the move to shallow water. The day I fished with Murphy, dozens of ice anglers were still plying the deep water. And a few lakers were being pulled from water over 75 feet deep, no doubt because the lake’s alewife population had not fallen to zero. But Murphy marched us across the mile-wide lake to set our tip-ups in the shallows, and that’s where we found the lakers truly feasting. Last winter, I read a couple of fishing reports from outside of New York where a lack of lakers also had become a sore point with the local ice anglers. One of my friends was taking a trip to one of those declining lakes, and on my advice (after I had fished with Murphy) he set up shallow and caught more lake trout than he ever had on that lake. During the cleaning, he found a mess of small yellow perch in an especially plump lake trout. Another instance of lake trout in the shallows played out on a trip to West Grand Lake in eastern Maine. Over the course of an exciting if sometimes grueling three-day ice outing, we caught lakers just a foot or so below a heavy sheet of ice. Besides these togue (the local name for lake trout), we were targeting landlocked salmon and whitefish. Our guide, John Arcaro, explained that while he might fish over medium depths, he typically set the live smelt or sucker bait just 6 inches below the ice. Yes, just 6 inches. Understand that the ice on West Grand Lake, by the time the season opens in January, is usually several feet thick. While West Grand Lake has depths of some 130 feet, we fished mostly in 12 feet of water atop a large underwater ledge. “Shallow structure is the key,” Arcaro said. Both Murphy and Arcaro followed the bait to find the fish. However, aside from fishing relatively shallow, the tackle and tactics used were much different. With Murphy on Otsego, where the ice was only 8 or 9 inches thick without much snow cover, fishing just beneath the ice would not have been a good idea because the light and the angler noise both penetrated. Murphy set his shiners and suckers close to bottom, only about 18 inches up. We caught lakers as shallow as 8 feet but considerably more at 12-15 feet, still much shallower than the norm back when alewife were abundant. Because of a one-trout lake limit, we used circle hooks for the easy release of most fish. I landed six on tip-ups the first day and five the second, releasing all unharmed. I even caught a few on jigging spoons, perhaps not as high a percentage play as bait. I enjoyed the hard strikes, but in a party of five anglers, by no means was I high hook. Arcaro’s approach was different because it was refined on a much different West Grand Lake, where heavy snow and thick ice are the norm. When fishing with Arcaro, we began the day shoveling deep snow away from the spots where we set up shop on 2-foot-thick ice. Last season, he even tried a high-visibility chartreuse main line, and it did not seem to decrease strikes in the least. Same as Murphy, he prefers a single-point hook, but a short-shank live bait hook of thinner wire with an offset eye. He said this works best because the togue and salmon are quick hitters, coming up from beneath the bait and slashing into it. While tackle and technique may vary, fishing shallow is the real “secret” to both guides’ ability to catch lakers where others are no longer doing so well. 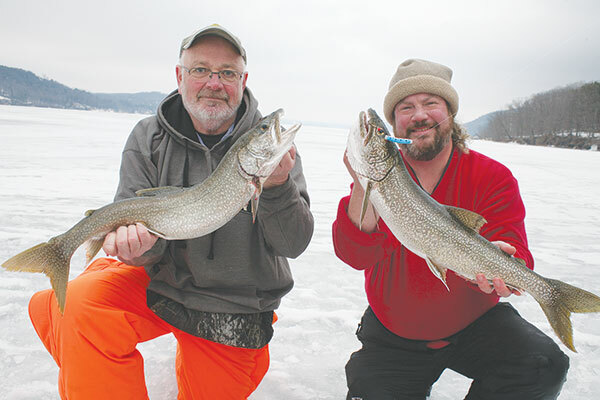 When you are having trouble finding lake trout under ice, they may be feeding a lot shallower than you think.